The new Tegra Zone app is so awesome that it even breaks news. 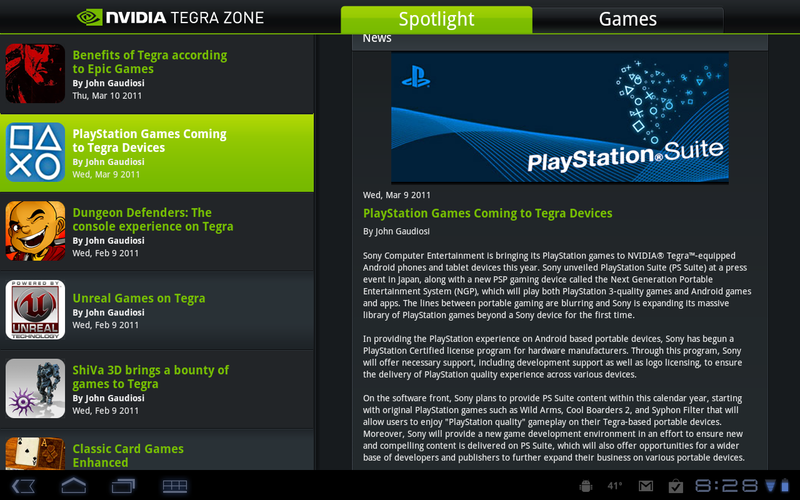 Through the news reader section of it, we were introduced to word out of Sony’s camp that PlayStation games are indeed headed to Android devices (both phones and tablets) running Tegra 2 processors. The plan is to have the first set of games out some time this year through their PlayStation Suite which would include Wild Arms, Cool Boarders 2 and Syphon Filter. Sony is obviously realizing that mobile gaming is making portable gaming devices a lot less attractive these days and has decided to make their massive library available for the first time. Licensing to manufacturers has already begun, which means that developers will be cracking away on your favorite games in no time.